“The only thing more difficult than being married to a narcissist is divorcing a narcissist.” This is one of the first sentences that Tina Swithin writes in her book, Divorcing a Narcissist One Mom’s Battle. It’s a sentiment I’ve heard time and time again from Lovefraud readers who have faced the same battle. When Tina met Seth, she didn’t know he was a narcissist. In fact, like most of us, she didn’t know what a narcissist was. But she was 25 years old and felt like she was ready to find a real relationship. Before Seth, Tina had been in relationships in which the man required “fixing.” She realized that she didn’t want to fix men. In fact, she wanted to fix herself, so she wouldn’t feel obligated to fix others. After a year of self-reflection and therapy, she felt great and ready to move forward in life. At the time, I remember questioning whether or not this was all too good to be true. In hindsight, if things seem too good to be true, they probably are. Seth viewed her as a trophy girl, showing off her attractive picture to clients. Seth told Tina that he loved her two months into the relationship, but Tina felt like he was announcing a business deal. Seth urged Tina to discard everything from her life before him, because his was a better way to live. There were times when Tina did feel that something was amiss and questioned Seth. She quickly learned that questions led to put-downs, accusations. Then she discovered outright lies. And she felt that Seth was spending money recklessly. But when she confronted Seth about any of these issues, he used all the tricks love bombing, the pity play, pleading to win her back. It worked. Tina married him. Marriage wasn’t at all what she expected. Rather than togetherness and affection, it was a whirlwind of credit applications, business deals, overspending and confrontations. Then Tina became pregnant. Seth was not happy this was not part of his plan. When their daughter arrived, and their second daughter arrived, Seth showed little interest in them. Tina felt alone in her marriage. What attracted her to Seth? What warning signs should she have paid attention to? The fourth list was the longest, by far. It took awhile, but Tina finally left. Then the real trouble began. Even Lovefraud readers who have their own stories will be shocked by this man’s vindictive and even dangerous behavior. Stalking, break-ins, threats and when the girls were in his care, negligence. And then there was the nightmare of Family Court. A parenting evaluation stated a list of requirements that Seth needed to meet, like parenting classes, anger management, and not driving them without a valid driver’s license he had lost his for drunk driving. Seth did not meet any of the requirements. No matter the court awarded him additional visitation time anyway. Tina could not afford an attorney, so she learned how to represent herself. It took awhile, but she proved Seth’s lies to the court, and won full legal and physical custody. Then she succeeded in allowing her ex only supervised visits with the girls. Finally, after years of court battles, she eventually succeeded in having her ex-husband removed from the lives of their daughters. Everything Tina endured will sound so familiar to anyone who had fought a custody battle with a narcissist, sociopath or borderline. But Tina persevered, and eventually she won, which is heartening. It can be done. At the end of the book, the author includes a section called “Tina’s Tips,” perhaps the most helpful section. It’s a blueprint for how to go into a custody battle with a manipulator covering everything from emotional preparation to documentation to staying calm in court. 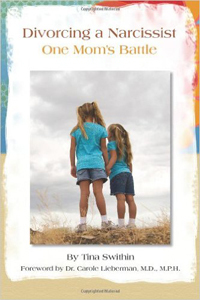 In the end, this book aptly describes the insanity of co-parenting with a disordered manipulator, validates the experience of readers who have been there, and serves as a guiding light to help you escape, survive, and eventually, thrive. Divorcing a Narcissist One Mom’s Battle is available on Amazon.com. Today is my 24th wedding anniversary (even though I left him almost 3 years ago). He used my daughter as a pawn to get me to come back to him last year. To keep her from me he told her horrible things about me. I left HIM and every kind of abuse imaginable, NOT my daughter, but that’s not what he told her! He told our mediator that the only way he’d share custody with me was if I came back to him, so I did. He was, at the time of our “reconciliation”, not just with one other woman but two and even had a “boyfriend” that he shared an $80,000 secret bank account with. Two months after I moved back in with him and discovered his lies and betrayal he came after me and threatened to kill me (he only stopped when he saw that I was holding my cell phone and he heard my best friend screaming “Call the cops!”) I threw him out and tried to get a restraining order against him. The court denied it. He then began the process of terrorizing and stalking me (he even hired someone to break into my home at 3 am. This man was caught by the police and admitted to them that my husband had hired him) I finally got my RO but it was later dismissed thanks to my second USELESS ATTORNEY who, like the first, did NOTHING to help me and even ignored the Private Investigators that SHE told me to hire! To cover up his nefarious activities (and shady “business” dealings) my husband, once again, easily obtained a restraining order against me by, once again, lying to and conning the judge. I’m in the process of fighting this (my THIRD) restraining order and I go to court tomorrow. I’m grateful to my THIRD attorney who listens to my PIs and is doing something to uncover the truth about his lies, abuse, predatory behavior and criminal activities. I’m praying that my daughter and I will finally have justice in our favor and can live in peace. These demons do not love their children, they use them, they use the courts and they use EVERYONE! If you think that living with them is Hell, try divorcing them. Please pray for justice for me and my sweet, wonderful daughter who doesn’t deserve any of this. I would appreciate it very, very much! They never go away if you have children, they use them against you if they do not have a better target. I had a respite when he was busy with other women targets but he came, the stinking dead vampire he is. He wanted to play “small town high school football father” so he took my son when he was 15. He bribed him with a car. Now, after 3 divorces, he has my daughter and grandchildren. He bribed them to move to where he lived to a job for her that was a career step down. Fortunately when she figured that out she was able to get a job back here and moved back but our relationship is forever ruined. She believes his lies and his pity ploy. She thinks it is my fault I because I will not see him. For my own sanity, I finally refused to see him any more and she has him every holiday as he demands. I will see my grandchildren for Christmas this year for the first time in 6 years because she is working and having her dad for Christmas eve. I would not go if she was going to be there. Her husband recently lost his father, my grandchildren’s grandpa so I am going for them. Daughter is not making it easy. She is lying and sneaking about it but I found out anyway. As if I did not already know. I found so much wonderful advice on Tina’s website while I was going through my own custody battle, and just all around support and relief knowing I wasn’t alone. I can just imagine how wonderfully written her book is. I’m so glad her daughters were saved from their father, and I pray for you too Rosie. It was definitely the worst thing I ever went through leaving the P and fighting for custody for our son, much worse than living with the abuse. I think it’s because when we are with them they focus most of their abuse at us and we think (incorrectly) that we can spare our children from the majority of it, and then when we leave them it is torture watching the majority of their abuse focused on the children when they no longer have that power over us. As mothers we would much rather be abused ourselves than watch our children being abused. BUT – there is light at the end of the tunnel. Keep fighting to protect your babies, eventually the truth will come out. If nothing else when your children are grown they will know you fought for them until the end, and when they see their P parent for who they are they will know why. Going through that battle almost killed me, but two years later with a happy healthy little boy it was worth every second of it. Stay strong and trust your gut when you need to make decisions. You know what’s best for your child, don’t let anyone try to convince you otherwise. Hugs to you! Almost fifty years and the “children” do not want to see the truth. I did not ever want to tell them but was forced to to protect my grandchildren when I found out they were spending time alone with the evil one. My son knows what his father is, he remembers the abuse before I left. My daughter sees it but is under his pity spell. Both try to ignore it and blame me because I called a spade a spade after all of these years of protecting them from him and what he is. It was worth it in spite of the backlash because at least my daughter will not let her children see him alone. They are safe. The only regret I have is marrying him in the first place. Despite there being no evidence WHATSOEVER, just a bunch of lies, the judge at my hearing has decided to “mull it over”. I believe that this judge and every other judge in town is afraid of my husband and his “minions” and what might happen if their ruling does not go in my husband’s favor. The problem with the tactics that the psychopath uses in court (and everywhere) is that their lies are so outlandish that because most people think that the truth must be somewhere in the middle it is thus, not in your favor. People think that you must have done SOMETHING and the P is perhaps just exaggerating a bit. For example, you could be sitting on the couch, watching tv with your daughter and doing NOTHING and the p decides to come after you. He gets a minion to make a threatening phone call to him that sounds like Linda Blair in the Exorcist. He presents that to the judge and says its you. He has no phone record of your number coming in to his. You have no such call in your phone records. Your daughter says you were with her and didn’t make the call. You have hired a voice analyst who says its not your voice, etc. etc. But that’s just an example, something to “mull over”. Any thoughts? Prayers for justice much needed and very appreciated! I’m new to this site. Thank you for your posts it does help though I’m far from healed. I left my abusive husband and filed for divorce more than a year ago. I asked each of my children with whom they wanted to live . I didn’t want custody to be an issue and fight for anyone who didn’t want me to fight for them. So three of my five kids went to live with him. It’s heart breaking but necessary since he spent years reducing me to the size of a pea with my children. I’m even amazed that two of my children want to be with me. Still my divorce is at an absolute standstill. I have a good judge who has found him in contempt of court and fined him thousands of dollars. But still he won’t comply with court orders. Nothing seems to break him. His job is now aware of his alcohol abuse. Still nothing moves forward. I hope that time will find my children back in my life (the visits became so horrible that I couldn’t subject my children to them as they would call crying saying their father was mad-but still they don’t want to come back to me). So I wait, I make plans to move out of state, u imagine a life of peace that seems like a mirage. He is trying to break me down so that I “beg” to come back and he can tell his fan base that he didn’t want me but I’m clingy. The longer this divorce takes the more hope I lose. He knows this. He knows I want to move, I need to move. Tick tock. Any advice?